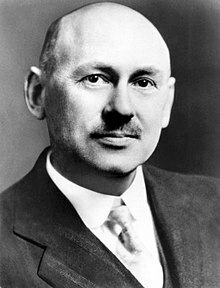 Robert Hutchings Goddard (October 5, 1882 – August 10, 1945) wis an American ingineer, professor, pheesicist, an inventor wha is creditit wi creatin an biggin the warld's first liquid-fueled racket, which he successfully launched on Mairch 16, 1926 usherin in an era o space flicht an innovation. Goddard an his team launched 34 rackets atween 1926 an 1941, achievin altitudes as heich as 2.6 km (1.6 mi) an speeds as fast as 885 km/h (550 mph). ↑ "Goddard launches space age with historic first 85 years ago today". Retrieved 2016-04-29. ↑ "Exhibition". Smithsonian Institution. |contribution= ignored (help). ↑ "Rocket Apparatus". Patents. Google. Retrieved 2010-05-01. ↑ 4.0 4.1 "Goddard". Astronautix.com. This page wis last eeditit on 5 Apryle 2017, at 03:26.